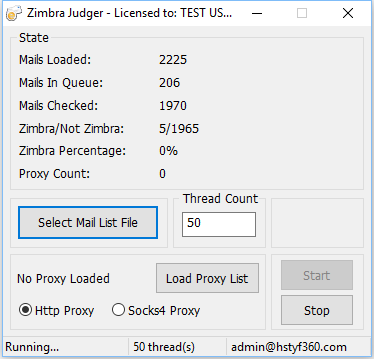 This software is used to check if the emails are hosted by Zimbra. *the format of email list you need to load is every email in straight line, not comma separated. [Original Software] URL Link & Domain Collector [Original Software] EMail Sorter – Tool for sorting emails from office365, godaddy, gmail, yahoo etc. hello can i get your skype id ? ADMIN; PLS EMAIL ME WITH PURCHASE & PAYMENT PROCEDURE. I WANT TO PAY VIA BTC. PLS SEND ME YUR BTC ADDRESS & HOW DO I RECEIVE THE SOFTWARE + LICENSE KEY ?? AND PLS; I HOPE THIS SOFTWARE DOES NOT EXPIRE WITHIN 1 YEAR ??? hello how much do you sell? do you have software that can sort emails hosted on cpanel? ?